Compared to other fields (such as media, banking and communication), the integration of information and communication technologies (ICT) in health has been slow. Among other factors, the lack of systematic education has been identified as a significant barrier. The use of ICT in healthcare delivery is widely known as e-Health. Evidence shows that if used in right context, e-Health can be efficient and cost effective. While designing e-Health curriculum, there are a number of factors to be considered. Due to the specific nature of the subject matter and the learners, the traditional teaching methods and pedagogical constructs may not be suitable. The choice of education methods must be based on the capacity of achieving the learning outcomes. E-Learning has proven to be an effective way of delivering education, particularly for rural and remote learners. Based on blended learning model, E-Health teaching at the Centre for Online Health University of Queensland, Australia has shown its capacity to provide a unique learning experience to students. While designing e-Health curriculum, a particular attention has been paid to aspects such as flexibility of learning processes, students’ control in learning, self observation and self evaluation. 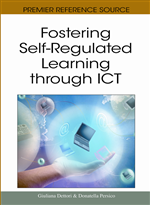 These are, in fact, core principles of self regulated learning (SRL) that have been incorporated in the teaching and learning process of e-Health. This chapter sets out to examine in details the elements of SRL embedded in e-Health teaching and the role of SRL in maximizing the learning outcomes.